NASA image by Norman Kuring, NASA’s Ocean Color web. Caption by Mike Carlowicz, with assistance from Norman Kuring. Phytoplankton are the grass of the sea. They are floating, drifting, plant-like organisms that harness the energy of the Sun, mix it with carbon dioxide that they take from the atmosphere, and turn it into carbohydrates and oxygen. Phytoplankton are critical to the marine food web, being the primary producers of food for the oceanic food web, from zooplankton to fish and shellfish to whales. Like plants and trees on land, phytoplankton give us a lot more than food. Scientists estimate that at least 50 percent of the oxygen in our atmosphere has been produced by phytoplankton. At the same time, they are responsible for drawing down significant portions of the carbon dioxide from the air. The tiniest of living organisms exert an outsized influence on the planet. In mid-summer 2016 in the Southern Hemisphere, they took up an outsized parcel of real estate in the Southern Ocean, as shown in the image above. On January 13, 2016, the Visible Infrared Imaging Radiometer Suite (VIIRS) on the Suomi NPP satellite captured this view of extensive phytoplankton blooms stretching from the tip of South America across to the Antarctic Peninsula. The image was built with data from the red, green, and blue wavelength bands on VIIRS, plus chlorophyll data. A series of image-processing steps highlighted the color differences and more subtle features, such as nearly a dozen eddies of varying sizes. The parcel of blooming ocean—at least that part visible through the break in the clouds—stretched from 56° to 68° South latitude; that is roughly 720 nautical miles or 1300 kilometers from top to bottom. At the widest point, the plankton-rich waters spread from 78° to 93° West longitude, or roughly 480 miles (770 kilometers). Of course, these measurements only account for what we can see between the clouds. 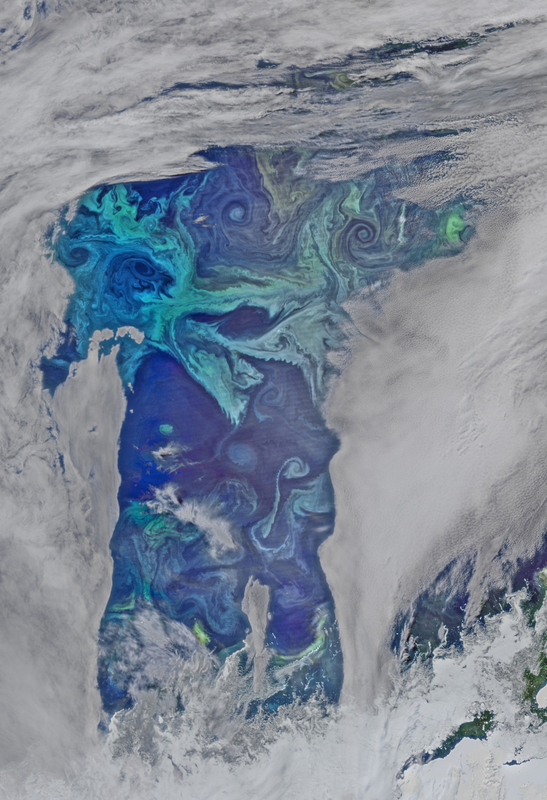 The blooms in this image formed just west of the Drake Passage, one of the most turbulent mixing regions in the ocean. Winds and water currents are steady and strong, and the ocean and atmosphere exchange a lot of heat, water, and other natural chemicals. With abundant summer sunshine and lots of nutrients being churned up, the waters can become a factory for the creation of oxygen. The Southern Ocean has been an area of intense study and educated speculation in recent years. 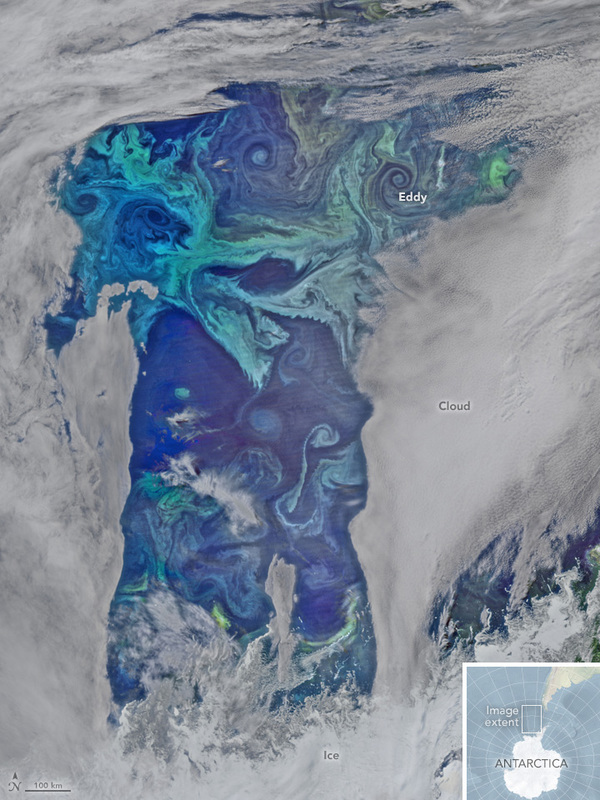 Modeling by researchers at the University of Tasmania recently suggested that the growth of phytoplankton in the Southern Ocean, particularly diatoms, might double by 2100. Other research led by the University of Washington has suggested that blooms in the far southern waters alter the cloud cover of the region by releasing chemicals (such as dimethyl sulfide) and by becoming airborne seeds for clouds (when picked up by winds). A third group from the University of Sheffield examined ocean color imagery and found that icebergs often create phytoplankton-rich wakes that can drawn down carbon dioxide from the atmosphere for as long as a month. Antarctic Climate & Ecosystems Cooperative Research Centre (2015, October 6) Southern Ocean phytoplankton growth set to double by 2100. Accessed February 5, 2016. EarthSky (2015, June 8) How much do oceans add to world’s oxygen? Accessed February 5, 2016. NASA (2015, July 24) Marine Plankton Brighten Clouds over Southern Ocean. Accessed February 5, 2016. The University of Sheffield (2016, January 11) Giant icebergs play key role in removing CO2 from the atmosphere. Accessed February 5, 2016.